RenewBuy gave a new direction to my career as an Insurance advisor. Earlier, I was selling insurance for one company only, but after becoming POSP with RenewBuy, I got an option to sell the insurance policies of multiple companies associated with RenewBuy. Benefits of Becoming RenewBuy’s POSP? Hassle free Online Process: Once you become a POSP with RenewBuy, you are all set to sell Car, Two-wheeler & Health Insurance policies online. Multiple Choices: As RenewBuy is partnered with multiple insurance providers which gives an opportunity to work for more than one insurance provider to its POSP. Extra Income: The easiest way to earn extra income without putting much of your efforts is by becoming a POSP with RenewBuy and earn as much as you want to. Zero Investment: All you need to have is a smartphone with internet connectivity. How much one can earn as an Insurance Agent? It totally depends on person to person. Being an insurance agent, if you can understand people’s requirement and advise them to buy the product that is better for them then sky is the limit. The more efforts you put in your work, the more you can earn. What is the Educational Qualification to become an Insurance Agent? To become an insurance agent, the minimum educational qualification criteria is 12th pass, though there are many insurance agents who have bachelor’s degree, but the minimum qualification is +2 only. Which all Insurance Companies' policy can a RenewBuy POSP sell? There are two categories in which RenewBuy is dealing i.e. Motor Insurance and Health Insurance. So, a POSP with RenewBuy can sell policies of both categories offered by following Insurance Companies: Bajaj-Allianz General Insurance, Bharti AXA General Insurance, Digit Insurance, HDFC Ergo General Insurance, ICICI Lombard General Insurance, IFFCO TOKIO General Insurance, New India Assurance, Reliance General Insurance, Religare General Insurance, TATA AIG General Insurance. What happens when you fail the POSP agent’s exam with RenewBuy? You can always refer study material (available on the internet) and take the exam again. There is no cost involved here and multiple attempts of exam can be taken without any additional cost or training. What is the training duration and syllabus for becoming RenewBuy POSP? For becoming a POSP with RenewBuy, one must undergo an online training of 15 hours. Training consists of 5 Modules, and on each module, one must spend minimum 1 hour to move to the next module. The training syllabus covers all the basic and advanced information on Insurance. Why to become an Insurance Agent? Be your own Boss: By becoming an insurance agent, you need not to follow orders, in this case you will be your own boss. No fixed working hours: There will no fixed working hours. The more you spend time on your work, the more you can earn. Extra Earning: You can also work as a part time agent and can earn extra income above your monthly earnings. You can work as much as you want. No need to go anywhere: You can issue Insurance policies online. Almost Zero Investment: All you need to have is a smartphone with internet connectivity. 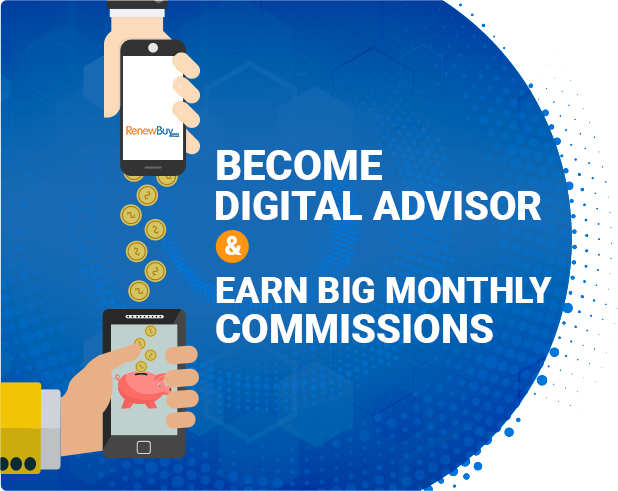 Thank You for showing interest in becoming RenewBuy's Khushiyon ke Advisor. Our Relationship Manager will Call you shortly!